Regina Domingo is a dive instructor, sailor, conservationist, producer, photojournalist, campaigner, and passionate researcher behind the documentary Game Over Fishing. Six years ago, she decided to devote her life to the ocean after a profound experience volunteering with Park Rangers on a world heritage site. She patrolled the waters of Cocos Island and Costa Rica for two months with the Park Rangers, protecting sharks from illegal shark fishing. Regina has said, “the oceans need us now more than ever and humans need to be infatuated with nature”. She is currently living in mexico, working with sharks, both dead and alive, in an attempt to understand what is happening to their decreasing population, all the while inspiring others to protect them. 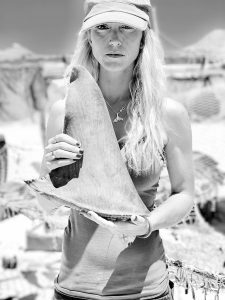 Her dedication for the ocean has led her to become the founder, and executive director of Nakawe Project, a non-profit organization that dedicates its time and efforts to the protection and conservation of marine life around the globe. As the director at Pelagic Safari, the career path she has chosen is ocean centered. She is also directing an Ecotourism platform (Pelagic Safari in Baja California Sur, Mexico) which introduces and engages people with the Pelagic life that surrounds Baja California. She is passionate that Ecotourism is the key to connecting people with the oceans, and the species that call the sea home. Part of her mission is to share the message, that if people grow an appreciation for the sea, positive changes will be made. Growing up by the Mediterranean Sea, next to Barcelona, Spain; She has been surrounded by the ocean her entire life. With massive persistence and intense courage, she managed to gain access to places no one else has. Doing so has led her teammates to believe she is an unmatched researcher for documentary work. Regina has worked directly with government authorities, organizations, and different creative teams in numerous locations throughout the world. Her experience includes working in shark conservation with Randall Arauz of Pretoma for two years in Costa Rica. They collected and analyzed data that led to the protection of the Silky and Thresher Sharks in CoP17 CITES. Her film experience includes being a fixer for the Rob Stewart Film, Sharkwater Extinction, Mission Blue film with Kip Evans about the Shark fisheries and trade, and fixer for National Geographic Wild and a fixer for Pilgrim Media Group. Her persistence never expires, and because of that, she never quits. Regina is always reaching to obtain the necessary information and footage required to allow the information to reach billions of people worldwide. The result being a change in the positive direction to work together for ocean conservation.